Marsh, James H.. "Northern Dancer". The Canadian Encyclopedia, 27 July 2017, Historica Canada. https://www.thecanadianencyclopedia.ca/en/article/northern-dancer. Accessed 22 April 2019. Northern Dancer, racehorse (b at Oshawa, Ont 27 May 1961; d at Chesapeake City, Md 16 Nov 1990). Northern Dancer posing with owner E.P. Taylor and jockey Bill Hartack after winning the Queen's Plate in 1964 (courtesy Canada's Sports Hall of Fame). Northern Dancer, racehorse (b at Oshawa, Ont 27 May 1961; d at Chesapeake City, Md 16 Nov 1990). Bred at E.P. Taylor's National Stud Farm, Northern Dancer was unsold as a yearling, but as a 2-year-old won the Remsen Stakes, NY, the Flamingo and Florida derbies, and the Summer Stakes, Coronation Futurity and Carleton Stakes in Canada. 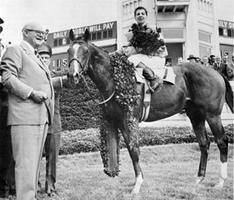 Northern Dancer was the first Canadian-bred horse to win the Kentucky Derby (1964) and went on to win the Preakness, finish third in the Belmont and win the Queen's Plate. Known for his stamina, Northern Dancer was also very fast - only Secretariat has bettered his Kentucky Derby record of 2 minutes flat for the 1-mile course. Retired to stud, Northern Dancer became the greatest stud horse in history. By the time of his death, 467 of his 635 registered foals had won races and over 150 had won stakes races. Many of today's best thoroughbreds trace their lineage to him. Some of his more important offspring include Epsom Derby winners Nijinsky and The Minstrel. Hall of Fame Racing career history of Kentucky Derby winner Northern Dancer from the National Museum of Racing and Hall of Fame.